The provision of sustainable energy supplies for an expanding and increasingly productive world is one of the major issues facing civilization today. 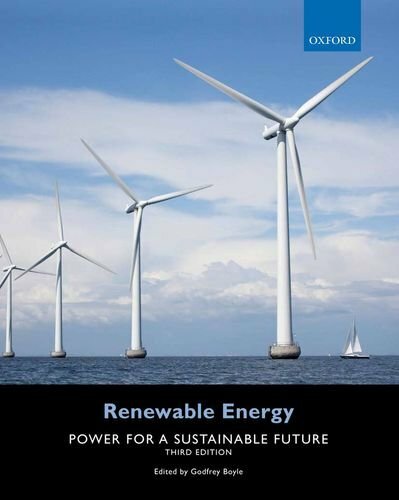 Renewable Energy: Power for a Sustainable Future, Third Edition, examines both the practical and economic potential of the renewable energy sources to meet this challenge. The underlying physical and technological principles behind deriving power from direct solar (solar thermal and photovoltaics), indirect solar (biomass, hydro, wind, and wave) and non-solar (tidal and geothermal) energy sources are explained, within the context of their environmental impacts, their economics, and their future prospects. Together with its companion volume, Energy Systems and Sustainability, Second Edition (OUP, 2012, 9780199593743), this book provides both perspective and detail on the relative merits and state of progress of technologies for utilizing the various renewables. The analysis considers emissions, sustainability, cost implications, and energy security, as political and economic pressures move society towards a low-carbon future. From an overview of basic energy conversion processes to a discussion of the individual renewable sources to a concluding examination of the prospects for their integration into national and international networks, Renewable Energy: Power for a Sustainable Future, Third Edition, provides a valuable insight into prospects for the renewables.